At times it is almost impossible to write an article without any grammatical mistakes hence the need for a copy editor. A mistake in a publication lowers the credibility of the whole company and takes a long time to regain the trust and credibility. Copy editors are people who go through a written material to correct any errors whether they are grammatical, punctuation or spelling. Some publications may have a particular style in which they want their articles to be written and copy editors go through the materials to make sure all the rules have been followed. A copy refers to the written material, whether handwritten or typed. In news publications, a copy editor also looks for mistakes that could them in trouble like defamatory statement and errors regarding facts. Depending on the publication policies, the copy editor can rewrite what they feel does not conform to the organization’s guidelines. Some, however, prefer to return the copy to the editor who had assigned the work rather than rewrite it. Many people do not distinguish between copy editing and line editing. Line editing involves looks at the creativity, and the language used to in writing and do not necessarily focus on spelling and grammar. So What Exactly Does a Copy Editor Do? A good copy editor should have a command of language so that they can effectively point out the mistakes in a copy. A copy editor corrects grammatical errors, punctuation, and spelling. Changes passive voices to active voices if there is the need to do so. Gets rid of unnecessary words and inappropriate jargon in a copy. Removes redundancy in a copy. The most important tools for copy editor are a reference book. Among the reference books a copy editor should have a dictionary to guide them. In organizations which have their own set guidelines, the copy editor should have access to the guide book containing the guiding rules that the company follows. Always use those resources to improve your work. Notebooks: Copy editors need notebooks to write down important notes. It could be some of the most common mistakes they find in written materials or any good ideas from the materials. Copyediting newsletter: A newsletter helps a copy editor to know the changes that are happening in the copy editing industry. The newsletter will help them keep up with the day to day updates about copy editing. Style guides: Style guides are essential for copy editors to know how to correctly format text and what grammar to correct. 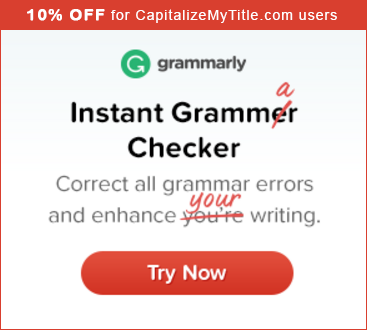 Grammarly: This tool checks for any grammar mistakes. The tool points out the errors and gives suggestions and explanations for the errors. ProWritingAid: The tool shows areas where certain words have been overused, the length of sentences in a paragraph and repeated words or phrases. editMinion: The tool points out areas where the writer has used passive phrases and wrongly placed adverbs. SmartEdit: This tool is very useful to a copy editor since it highlights spelling mistakes, repeated phrases, and adverbs. When going through a story, there are common things that might seem obvious can but actually, be problematic. Always check the spelling of well-known people’s names if they are used in the story. Some of these people have names that are hard to write and it is, therefore, good to double check the spelling just to be sure the word is correctly spelled. In cases where a writer talks about a recent event that occurred whether it is a crime or any other major occurrence, always refer to earlier stories to see if the facts match. In case the facts do not match to those on another story; check other publications to see which facts are consistent. As a copywriter, you may be unfamiliar with some of the issues tackled in a story. Do not assume them. Check related publications to bring you up to speed with the issues. If the writer has used a quote, confirm from the writer of the quote to make sure that it is quoted as it appears. In some stories, writers may refer to someone as ‘the late’. As a copy editor, it is your duty to check whether the person is actually dead. Such a mistake can lead to a lawsuit. Look for an experienced person in the field of copywriting. The number of years a person has worked may determine how good the person is at the job. An experienced copy editor will also perform the task with ease and efficiently. A person who pays attention to details. In copy editing some of the grammar mistakes cannot easily be identified is a person is not keen and attentive during copy editing. A curious person. Curiosity with the surrounding is a plus since the person will know what is going on within their surrounding and therefore when editing a copy, everything does not seem new to them. Have a basic training in copyediting. As an organization, you should look for a person who has some training in grammar, scripting and news writing skills. Passionate about what they do. A person may have all the necessary qualifications in a job but lack passion for the job. Meaning they do not enjoy what they do. Such a person may not perform the assigned task to the satisfaction or may even find it hard to meet deadlines. If you want to become a good copy editor, you should be a reader. Reading ensures that you are up to date with what is happening and it, therefore, becomes easy to point out mistakes in a copy. Be a critical thinker. This is a person who can recognize good writing and are able to improve a bad copy instead of doing away with the whole copy. Copy editors are important in any organization since they help you avoid the shame of publishing a copy that is full of grammatical errors. Copy editors help you improve the quality of content in your publication. The best way to get better at writing is to seek criticism from peers and mentors who are invested in your journey to becoming a better writer. No one gets better without feedback, and writing is no exception. When I say to seek criticism, that does not necessarily mean asking someone to proofread your writing. Rather, have your coach evaluate your entire writing and suggest ways to improve. Constructive criticism is feedback you receive from someone else about your writing. Feedback can focus on any number of things related to your writing, including: tone/mood, grammar, vocabulary, flow, captivating intros, etc. A solid mentor, which we’ll discuss in the next section, will be able to provide you with feedback on all of these areas and help you identify the areas where you need to get better. Where can you seek constructive criticism? While you can always seek relatives or friends as writing coaches, the Internet has also opened up a whole host of other resources. From Subreddits about writing to online proofreading tools, you have access to writers and editors from around the world. Family and friends will probably be the most convenient sources who can provide feedback on your writing. While they may not be professional writers or editors, they can provide you with a general compass for your writing. Be wary of feedback from friends and family though, as it may not be as useful as criticism from strangers since people you know may hide your weaknesses so as to not offend you. The Internet is filled with forums that allow you to interact with writers from the around the world. The most useful website for writing feedback is the Subreddit /writing where hundreds of thousands of writers hang out. You can easily submit your writing to this site and have lots of comments within minutes. Other great online forums include Critique Circle and WeBook. There is no single place to find a writing mentor, but having one is a must in order to get better at writing. You can try searching forums online, reaching out to people in your local community, or asking friends and family if they have any recommendations. Even try reaching out to some of your favorite authors. They were once in your shoes and my bet is at least one who you reach out to will be willing to at least have a conversation with you about how to get better at writing. The best mentors will be able to give you unbiased feedback about your writing and ideally be very strong writers themselves. Don’t settle for a mediocre mentor or you will only produce mediocre writing. While not able to provide thematic feedback, the many automated bots online these days make proofreading and copyediting a breeze. Tools such as Ginger Software and Grammarly will instantly evaluate your writing and show where you need to change things or how you can improve. When you seek constructive criticism for your writing you want to make sure that you are getting the best advice. If one of these options, say a family member, is not working out, try a different method. It’s important that you have a mentor who can stick with you as you continue on your journey to becoming a better writer. It is important that you define your audience for writing. Understanding who you are writing for will determine the tone of your writing. Knowing who you are writing for will allow you to better captivate your audience. The first step that you need to take to define your audience is to determine who will read your writing. You will need to figure out if the audience that you are writing for is primarily technical, business, or leisurely. You will then need to look at the demographics within those groups to ensure that you are able to write in a manner that will grab their attention. Once you have determined which category your writing falls into, you will need to determine the demographics of the category that you are trying to reach. Each category will need to be broken down further to refine your audience. What type of business am I writing for? Is my primary audience male or female? What is the average age of people in this type of business? Am I teaching or informing? Once you have answered these questions, you should have a general idea as to what style of writing you want to use. Each of these questions will help you narrow done the time and style that you want to use when you are writing. What level of education does my target audience have? Am I explaining myself in a way that makes sense? How is the reader going to use this material? What age group is my target audience? These questions will help you determine the level of writing you will need to use. By using these guidelines, technical folks will be more inclined to consume your writing. Are you writing for men or women? Is the intent to entertain or inform? These questions are only a guideline to help you set the tone of your writing. If you intend to write for this audience, make sure you truly understand their needs as a slight misstep on this front could result in nobody reading your writing. Are you writing for business, technical, or leisure? Are your readers going to understand what you are trying to say? Are you writing for men, women, or both? Understanding these key points will allow you to become a great writer with whom readers eagerly engage. Misunderstanding who your audience is, on the other hand, can lead to you wasting your time writing something no one will read. What’s the number one way people are turned off by an author? Poor grammar and lots of typos. Ok, not always, but generally when an author has a typo he/she immediately loses credibility. How many times have you pointed out a spelling mistake on a menu? We know We have. If you’ve ever had issues with grammar or vocabulary, you are not alone. The onslaught of spell-checking software and grammar-checking websites exist for a reason. But never fear! There are a ton of ways you can improve your grammar and vocabulary. Getting better at anything requires you to identify your weak areas. The same is true for improving your writing, grammar, and vocabulary. Ask a friend or seek professional help in order to spot your mistakes if you cannot identify them. Figure out where you want to end up. Starting with the goal in-mind is crucial to bettering yourself. Want to improve your vocabulary? Set a goal to learn 100 new words in 3 months. Then create a strategy that will help you achieve that goal. If you set your goal around improving your vocabulary, set a goal to include 10 new words in every piece of writing going forward. With a goal and strategy in mind, you will soon be on your way to achieving your goal. Websites such as “Grammar Girl” provide daily tips and tricks for improving your grammar and punctuation. In addition, they provide lots of articles on correct usage. As we mentioned on Day 1, read more. The fastest way kids learn new words is by reading books above their reading level and looking the words they don’t understand up in the dictionary. The same habit for adults. Reading more will not only teach you new words, but also provide you with examples of proper grammar. The classic cliché that “practice makes perfect” holds true with improving your writing as well. If you truly want to become better with grammar and expand your vocabulary, there is no better opportunity than proofreading. Once you’ve read some guidebooks/blogs on grammar, you’ll be able to easily pick out common errors in others’ writing. There are a number of websites, scribendi.com and proofreadingpal.com to name a few, where you can apply to be a proofreader. Or just ask your friends to send their essays for school to you next time they need to submit one. Proofreading is great practice for improving your grammar and vocabulary skills. You may even get to crack open a Thesaurus to see if you can learn a new word or two while editing. Have you ever laughed at a typo you saw in the menu at your favorite restaurant? It may not have deterred you from the delicious “Chicken Farmesan,” but it certainly caught your attention. Recently, several psychologists have researched why we easily notice these typos and sometimes get angry or annoyed with them, particularly in emails (such as this one). People who scored high in conscientiousness or low on the “open-to-experience” trait were more bothered by the typos. People who scored low on agreeability were more bothered by the grammos [sic]. And people who scored low on “extraversion” were more bothered by both types of errors. In contrast, how people scored on neuroticism did not alter the impact of either type of error. The experiments couldn’t say 100% conclusively whether your friends will judge you negatively if you have typos in your messages, but did infer that you should probably proofread before sending. Especially watch out for those late-night text messages. As you continue on your journey to better writing, you may begin to feel a bit lonely. Maybe you’ve been spending quite some time indoors honing your daily habit of writing or you just wished someone were there to keep pushing you. Never fear! The revolution of the Internet has brought writing communities that are just a click away where you can join thousands of other people on a similar journey. Why Join a Writing Community? They serve as a forum to interact with different people worldwide. These people have the same passion for writing as you do and also want to become better writers. You can always seek advice from those who are further along on their journey than you. In addition, getting feedback on your writing from lots of different people will always make it better. People always share “goodies” on these communities. Whether it’s good books worth reading, meditation tapes, funny images, writing resources, etc., writing communities can provide you with valuable information. Postings for jobs or contests are always posted in these communities. And top of these reasons, you are making friends, which is always a plus. Making friends with folks from around the world who share similar interests will help you in your writing journey. You learn from different cultures and you share your knowledge with others. Where Can You Find Good Writing Communities? Surfing the net is the easiest way to find writing communities that fit your specific needs. Websites such as Scribophile are a good way to start. Reddit channels such as r/Writing also provide a great pre-built community where writers can share their work and get real-time feedback on it. There are also several Facebook pages that you can join or follow. From communities dedicated to work as a “Union for Freelance Writers” to sites where you can share a laugh with the people there or even share with your non-writer friends. If for some reason you don’t find anything that appeals to your taste, go ahead and create your own writing community. Make sure it has a specific focus though to ensure people stay engaged. Writing is like exercise or playing the violin. If you don’t continuously practice, you’ll lose your skill. You don’t have to practice very hard or for too long. The simple act of regularly writing will take you far enough. Form a daily habit of writing. Whether it’s in your journal from Day 1 or on a blog, make sure you write something every day. Even if it’s a paragraph to begin with, the act of starting to write will get your creative juices flowing. Practice. Practice a lot. Even if you don’t have something in mind, grab a piece of paper, your notepad, or even your laptop. Move to a place where you know you won’t be disturbed, and start writing. Just write about whatever idea crosses your mind. You may end up writing about the lottery numbers your mother played yesterday, about the beauty of the neighbor’s garden whose flowers are blossoming, or even about your crush who you saw this morning. The point is to exercise not only your creativity, but also how you manifest new ideas. Unless we are talking about your day-to-day job, writing is not meant to become something you work at as if it’s a high-school essay. Writing is meant to be for you, whether for therapeutic reasons, such as a journal, or the enjoyment of telling a story. If you treat writing like work, you will end up hating it. A “writing muscle” is useless without the physical body and mind behind it. To be a better writer, you need to make sure you’re in the best possible health. Reduce your stress as we taught you in Day 1, get plenty of sleep, and keep up your healthy physical exercise routine. If you practice the daily habit of writing, soon enough you’ll be writing novels without even thinking about it. Writing is funny like that. Ideas may evade your mind for a while, but once they start flowing, you won’t be able to stop them. Welcome to our seven-day journey to better writing. Your journey begins with exercises to increase your creativeness and daily writing habits, followed by resources to improve your current writing, and ends with how to publish. Today we’ll discuss how you can become more focused and creative in order to prepare for a writing session. Ever sit down to write and just end up starting blankly into space? Common as it is, writer’s block is not a pleasant thing, but the good news is that it’s easily rectified. Below are several ways you can calm your mind to let creativity back in. Mediation is quickly becoming a popular method for relieving stressors and letting ideas flow. Famous entrepreneur and tech mogul Steve Jobs was famous for his meditation. In fact, if he hadn’t founded Apple, he would’ve become a Buddhist monk. The essence of meditation is that you focus solely on your breathing, letting all extraneous thoughts go. While there are an abundance of apps, blogs, etc. with guided mediations, a good app to start with is Head Space. These days, there are a lot of excuses not to read. Too much work, too many kid activities, etc. You know what many of the billionaires in the world have in common? They read. Not only does reading free your mind from the racing thoughts of the day, but by consuming other peoples’ ideas, you expand the range of your ideas. I challenge you to read at least 30 minutes every day and not think of a new idea for a blog entry! If you’ve never journaled before, start by forcing yourself to write for five minutes a day; right before bed is usually a great time. Write about what you did that day and how you felt. What pissed you off or made you jump for joy? Over time, you’ll start tracking ideas and thoughts you’ve had which you can review at any time in the future. Moleskine journals are a classic component of the writer’s toolbox. I’ve had the pleasure of seeing Noah Scalin, the creator of Skull-A-Day, present twice, both times speaking about how living in a tech-driven world has reduced creativity. As a way of compensating, Noah has created #CreativeSprint, a 30-day email challenge that forces you to be creative every day for a month regardless of where you are. He also created a companion book that will challenge you to be creative every day of the year. Becoming more creative is your first step to becoming a better writer. The next step, presented in Day 2, is just writing. See you tomorrow! N – Names of people, places, etc. T – Titles of books, movies, etc. ‘Tis the season to deck the halls with boughs of holly, but it’s also the time of year to capitalize your Christmas song titles correctly so that you’re not embarrassed when your musical program contains the wrong capitalization. Here’s a list of some of the most popular holiday songs with their appropriate capitalization.